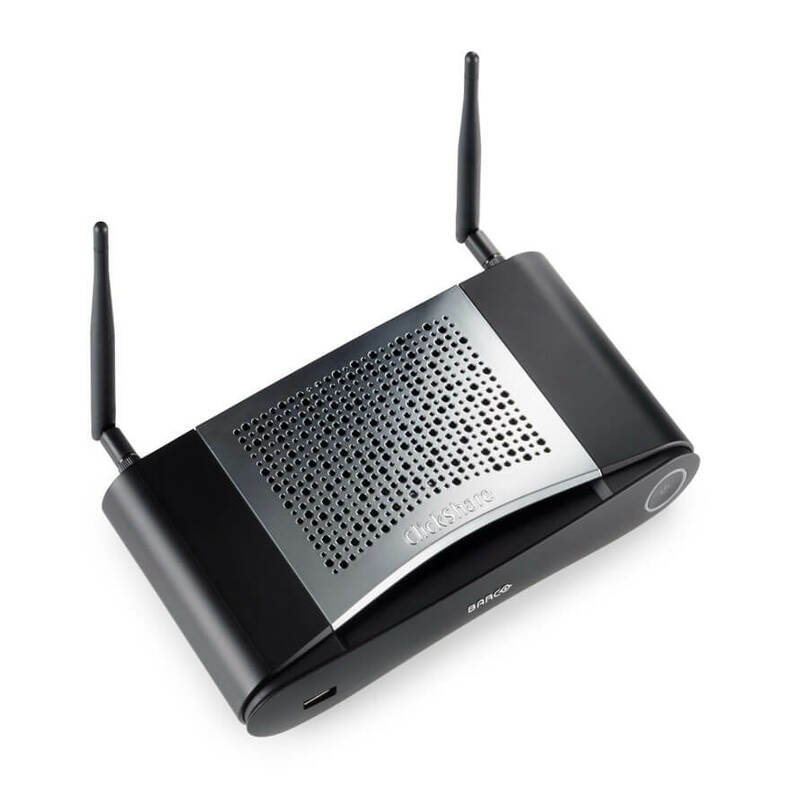 A Wireless presentation and collaboration system for boardrooms and conference rooms. 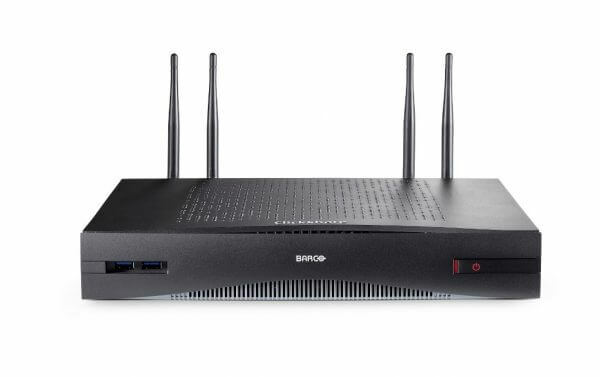 The CSE-800 was designed to bring the ClickShare experience to boardrooms, high-end meeting rooms, and conference rooms. 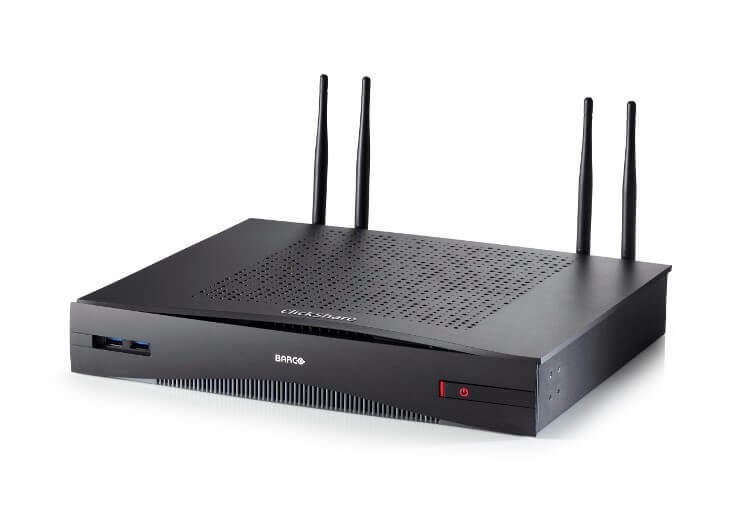 Introducing a number of unique features, including simultaneous sharing of up to 8 people, automatic & manual moderation, and blackboarding & annotation, the CSE-800 is the most powerful system in the ClickShare family today. 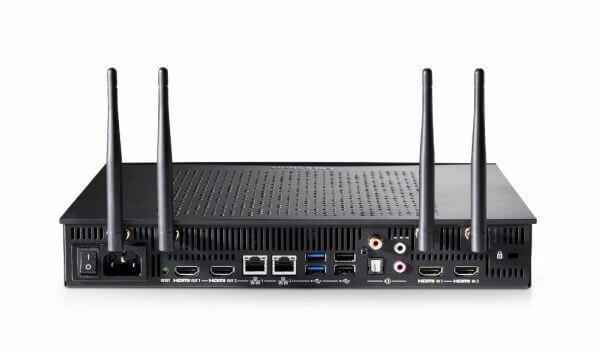 The CSE-800 was designed for enterprise rollouts and offers enhanced security features, a wider range of connectivity options – including AirPlay and Google Cast support for non-HDCP content – and central management. 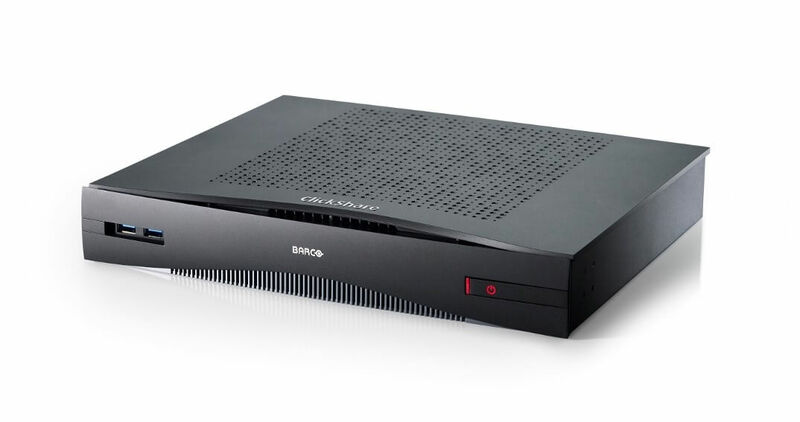 The CSE-800 features two HDMI inputs and outputs. 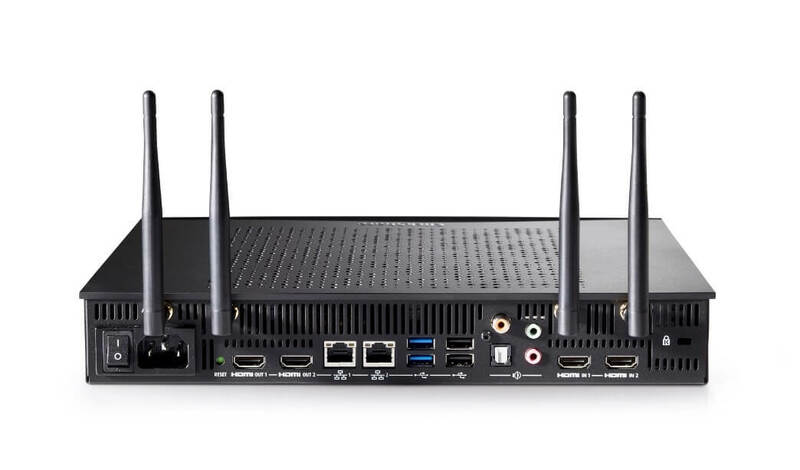 This means that there is a direct connection with legacy equipment and easy integration with conferencing systems, but also that two 4K UHD displays can be driven by a single base unit. This was specifically designed for use in larger rooms, with multiple people wanting to share at the same time. To prevent the rapid switching of screens, making the content difficult to follow, a moderator can manually select which content appears on-screen and when thus ensuring a great experience for all attendees. The moderation function can be switched off at any time, returning the system into ClickShare’s normal operating mode, with content being shared upon the click of a button. For user convenience, security features of the CSE-800 can be set to one of three predefined levels, depending on the company’s policies and needs. Available (depending on your operating system). May require ClickShare Extension Pack. ClickShare CS-100 Set (incl one button). 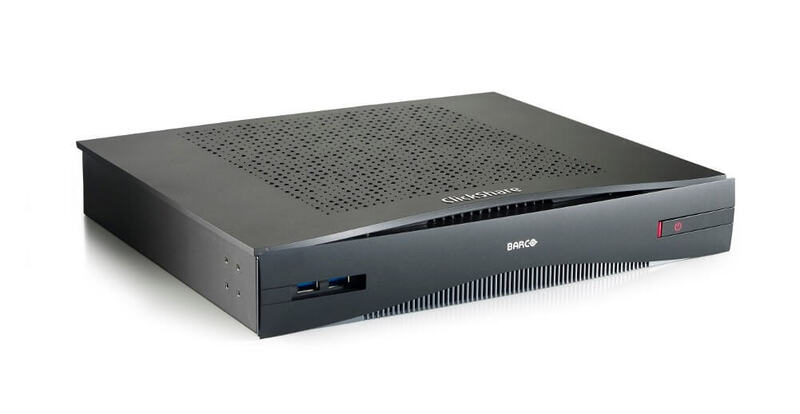 The CS-100 brings the ClickShare experience to small meeting and huddle rooms where sharing content from a laptop or mobile device is a basic need. Anyone – including guests – can connect with one click and share right away, without the need for any training. Users simply plug a USB-powered device – the ClickShare Button – into their PC or Mac and click the button to get the content from their laptop on the large meeting room screen. With the ClickShare App, users can also share content from their mobile phones or tablets. ClickShare CSE-200 Set (Incl two buttons). 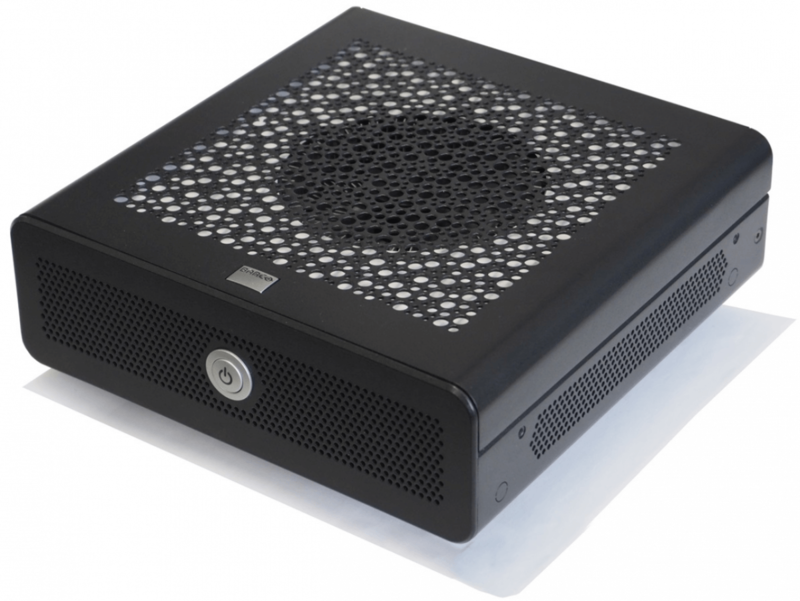 The CSE-200 offers the ClickShare experience for small and medium-sized meeting rooms. Anyone, including guests, can connect with one click and share right away, without the need for any training. Users simply plug a USB-powered device, the ClickShare Button, into their PC or Mac and click the button to get the content from their laptop on the large meeting room screen. With the ClickShare App, users can also share content from their mobile phones or tablets. Plug one of these USB devices into your laptop, and you are ready to share your content using the meeting room’s AV equipment. To ensure that your content is displayed on the right screen, every ClickShare Button is paired with a ClickShare Base Unit. The pairing process is quick and simple, so ClickShare Buttons can be transferred across meeting rooms without a problem. Multiple ClickShare Buttons can be paired with the ClickShare Base Unit, and depending on the Base Unit, one can share with up to eight people on-screen at the same time. Collaboration Management Suite (CMGS) is necessary for large projects. 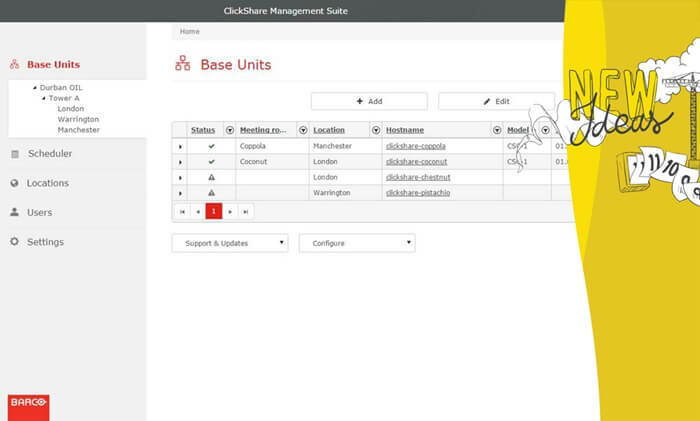 From one location, system administrators can manage the complete fleet of ClickShare & wePresent units throughout the company, in any location. This is especially useful in large corporations with many ClickShare & wePresent Base Units installed across different sites. What’s more, because Collaboration Management Suite is a web-based tool, the system administrator can use it anywhere. A new look and feel ensure a more intuitive experience, with enhanced stability and security of the application.